Save Transfer is a mod that lets you transfer your levels, reputation, credits, storage, cargo, ships, and weapons to another save file. This allows you to continue characters that would be broken by an update. For example, if a Starsector+ update breaks save compatibility, you can use Save Transfer to keep your progress instead of starting anew. Save Transfer is even mod-safe; incompatible ships/weapons will be removed from your fleet upon load. Mission/event progress (aside from specific exceptions, like bounty progress), and other campaign-specific items will not be transferred. Everything that was in storage submarkets will be thrown into your fleet or dumped out into a special storage area. Resupplying my weaponry has proven to be quite the adventure! So uh, what's up with the giant middle finger? Before Save Transfer™ every update I was in the dog house, my monument of destruction the Onslaught "Seeker of Dat Atlass" ran away from home. Now with Save Transfer™ me and my Onslaught can Conquest to Victory, Thanks Dark Revenant! Step 2: Open up the console (default: control-backspace) and enter "copysave"
Step 6: Open up the console again and enter "loadsave"
Nice, this will be very, very useful! 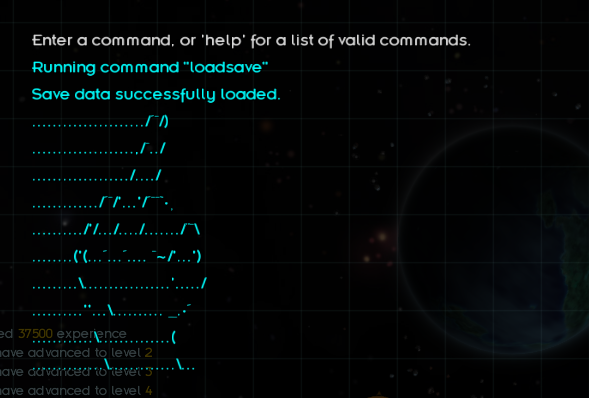 I would recommend you to hide that ASCII art in a spoiler though . Made a quick update because saving fighter wings was broken. So uh, whats up with the giant middle finger? I thought it was a bit boring to just have a screenshot of "Save data successfully loaded." We also recommend Version Checker 1.3 to notify you when an update is ready. Wait...What will happen to my stroage(s)? Code and decode almost everythings with a genomics approach. Served in Neutrino corporation as a long-term services and supports staff. They'll vanish, of course. I might as well include player-owned free-transfer submarkets (namely, Storage) in the scan for the next version. Good! I usually store things all over the sector. Hm... Not sure how easy this would be, but it'd be quite nice if this could copy over the autofactory's blueprint list if you're using it in combination with the autofactory. Is very useful even without that, of course. Will this work for SS version updates? Yes; however, I may need to upload an update to this mod to support new versions. I'll keep an archive (along with the then-latest Console Commands version) to make this easier, when the time comes. And no, this won't work in 0.6.2a. Any chance of adding support for the Omnifactory? Maybe not its inventory but at least the stuff it is producing.